Taste: Ultra chocolaty with that perfect combination of tropical coconut and nutty, earthy pecans. Texture: The cookies are ridiculously soft yet chewy and loaded with melty chocolate chips. Top that with the super gooey yet crunchy coconut topping and each bite is pure bliss. Ease: A few more steps involved than your typical cookie recipe but so worth it! The topping may seem weird at first but just follow the directions and you’ll be good. Appearance: Taking the extra time to drizzle melted chocolate over these really does elevate them to a new level, especially because the topping looks kinda strange on its own. Pros: Super fun and flavorful twist on a cookie. Cons: None, except maybe that I preferred these cookies on the first day they were made. Would I make this again? Mmmhmmm. I’ve seen German Chocolate Cookies a few times on Facebook. Each time I saw a recipe I made a mental note to add it to my “to bake” list. Unfortunately most of the recipes I kept seeing involved cake mix. Now, I have nothing against cake mix on a moral level. Sometimes you just gotta take a shortcut. This recipe takes cookies to a whole new level. I’ve had way too many sickeningly sweet yet bland cookies in my life. What a waste of calories. That’s why I love these German Chocolate Cookies. They’re rich and pack a huge flavor punch so they’re incredibly satisfying. And if you’re a huge chocoholic like me you’ll adore them! Plus, as a total cookie queen, you know I got you covered with a solid recipe. In a medium bowl, sift together the flour, cocoa powder, baking powder, and salt. In the bowl of an electric mixer, beat the butter, brown sugar, and granulated sugar on medium-high speed until well combined and smooth. Add the egg, egg yolk, and vanilla and beat until combined. On low speed gradually add the flour mixture. Fold in the chocolate chips with a rubber spatula. Bake for about 10 minutes, or until the cookies are set. Let cool on baking sheets for 10 minutes before removing the cookies to wire racks to cool completely. In a small saucepan set over medium heat combine the milk, sugar, egg yolk, and butter. Cook, stirring frequently, until the mixture has thickened, about 10 minutes. Remove from heat and stir in the vanilla, coconut, and pecans. Let cool until thick enough to spread on top of the cooled cookies. 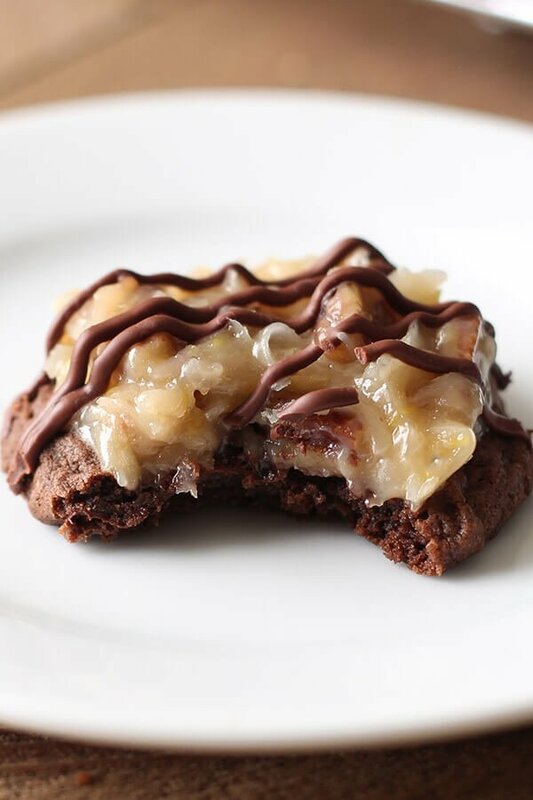 Drizzle the melted chocolate all over the cookies. Let everything set for at least 15 minutes before serving. Cookies are best served the day they’re made. Our family does not usually eat cake, especially because a cake is just too much for the three of us. I think these cookies would be the absolute best for my daughter’s 20th birthday, because she loves soft chocolate cookies and the one icing she likes is the coconut pecan. I can’t wait to make these for her next week. Additionally, these seem so much easier than cake to share. Thanks for making a recipe available that I can trust to have been tested. Hi Amy! I’m so happy to hear that! Sounds like this recipe was good timing 🙂 Happy birthday to your daughter! I don’t think so sadly 🙁 Not only are they best eaten the day they’re made but the topping is pretty sticky and would make packing and transporting a bit of a mess. I think I just drooled 🙂 I invite you to share your cookie recipes at my annual cookie swap linky party Hugs! I prepared this recipe and received rave review! Although they are very rich, they are also extremely high on the “yummy” scale, and no one who tried it didn’t want another one. Also, the instructions were extremely well done, and leave no worries about making an error. I will be baking these often from now on. Although I rarely make a recipe by simply following the directions, with this recipe, the only change/addition I incorporated was the use of vanilla bean paste, instead of just straight vanilla. Very good recipe! Thank you. Thanks so much for your comment! So glad you enjoyed the recipe. The vanilla bean paste sounds lovely! Tessa, I made these cookies and they are SO good, they will be a Christmas cookie for ever! I would like to know the nutritional information if possible. Can you substitute regular milk with evaporated milk?? Could these possibly be frozen? Just wondering with the topping and all. Just made these- followed the recipe to a T and they turned out phenomenal! Great way to start off the New Year, thank you for this delicous recipe!!! Only disappointment was the meager yield of 24. I’ll double the recipe next time. 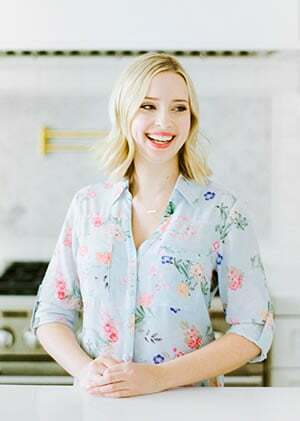 Hi Tessa, I will be trying this recipe out, I have two questions, can you omit the chocolate chips in the cookie recipe without ruining the recipe and referring to the packing question, couldn’t you pack them using parchment paper for the stickiness from the icing? Feel free to omit the chocolate chips (though they’re so much better with them!!) and as for packing with parchment, even then the weight of the cookies stacked kind of smashes everything. If you try let us know how it goes! 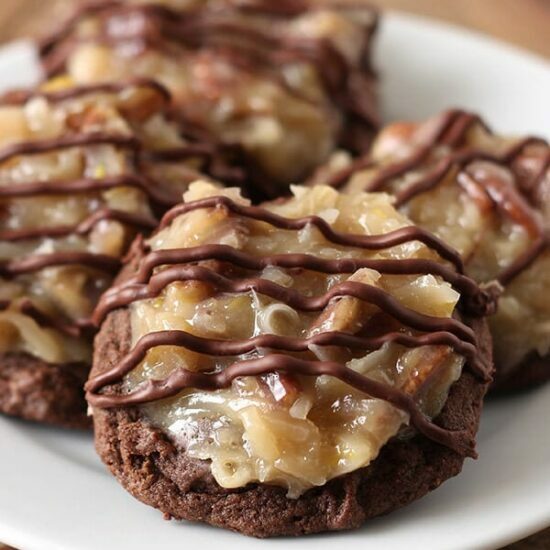 I’d like to make these, but want all of the German chocolate ingredients inside the cookies, without the addition of icing. I found some coconut-flavor-filled chocolate chips that I think would work perfectly in this recipe. I’m thinking of adding some coconut extract, sweetened shredded coconut and chopped pecans to the dough, in addition to the coconut morsels. I made these and they are incredibly tasty cookies! Even just the cookie by itself is a great chocolate cookie…thanks! I made these last night and they were absolutely wonderful. Put in fridge overnight and took to work and wow they were a great big hit and tasted just as good today as they did last night. Added to my cookbook already will make again for sure. Like you, I prefer to make things from scratch. Have you ever tried substituting Baker’s German Sweet Chocolate for the cocoa powder? 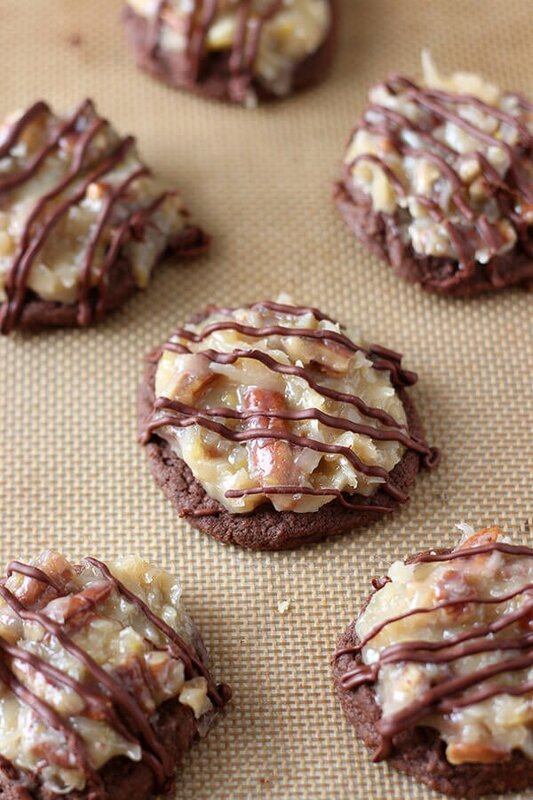 It’s so yummy in German Chocolate Cake, so I would really like to try it with these cookies. I know I would probably have to decrease the butter as well. And I thought I could grate the chocolate instead of melting it. Would you happen to know by how much I should decease the butter? The pictures make me swoon, BTW! Haha! 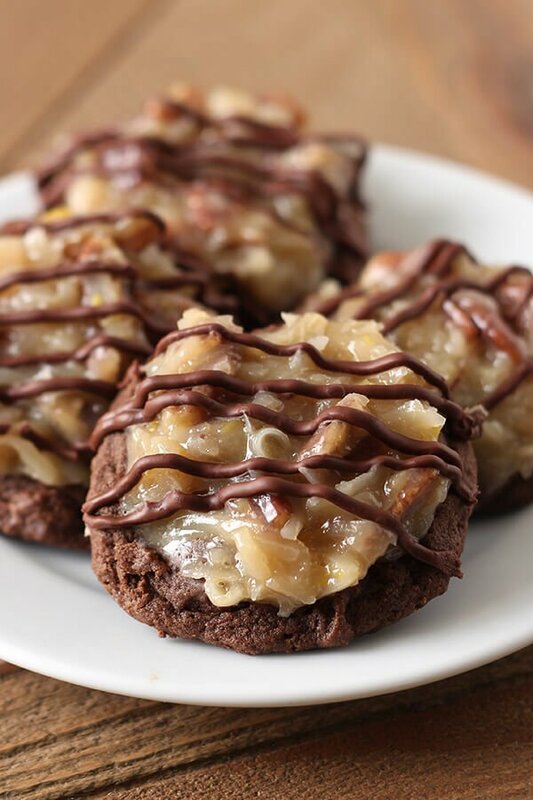 Well I really just took the idea of a German Chocolate Cake and made it into cookies! Let me know what you think of the recipe! As for stacking cookies, I use a staggered arrangement for each layer with wax or parchment paper between each layer. The bottom layers don’t take as much direct weight staggered. The recipe sounds yummy. Oh man, these cookies were amazing!! Hi, so I was wondering, if all I have is sweetened dutch process cocoa, could I just omit some of the granulated sugar in the recipe? Went to visit family. Made these cookies one morning. Same day made a second/double batch – family loved them. Put some in the freezer – wax paper between layers – 2 weeks later my parents texted me to tell me they loved them straight from the freezer. Tess – thank you for sharing these!!!!! I loved making these, they were amazing & such a great idea! Everyone loved them! Could you make the cookie up ahead of time and freeze them, then make the topping when you want to serve ? Would the cookie still be good? I couldn’t find the dutch processed cocoa, can I use Hershey unsweetened cocoa? 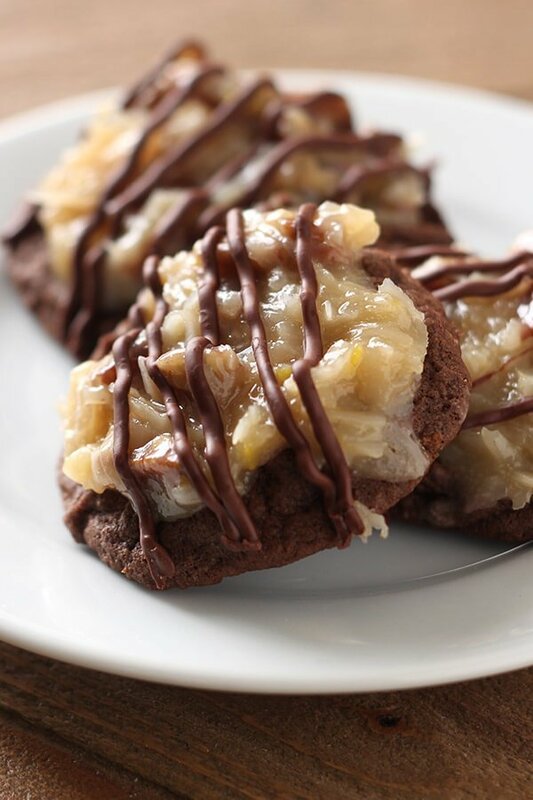 My cousin requested German chocolate cookies and I found your recipe. He and everyone that tried them loved them. I’m not a fan of shredded coconut so I was cooking without tasting but your recipe was easy to follow and turned out great. Thank you so much! I made these the Lazy way with a German choc mix and the coconut nutty frosting out of the can..with a 1/2 cup melted choc chips with a tablespoon of milk to thin it out put in a piece of wax paper made in a cone drizzled over top. The cake mix I added 3 eggs, 1/2 cup applesauce and 2 T milk. Hand blended. Dropped onto cookie sheet sprayed with Pam baked @ 350 10 min frosted warm. Perfect. Made 2 dozen. Placed in covered containers on waxed paper. Only downfall can’t stack them. Very moist cookies. My husband is from Germany and had never heard of German Chocolate cake either. Several years ago I read that German chocolate cake was named for the American who came up with the recipe and whose last name just happened to be German. Mystery solved. Could you make the cookie ahead of time and then put the frosting on at a later date? Are these cookies soft or do they harden. Does anyone have any idea approximately how many calories per cookie? We can’t get evaporated milk here in Israel. What can be substituted? Also sweetened shredded coconut isn’t sold. Can sweetened coconut strips be shredded in a food processor to make this? These are absolutely THE BEST cookies I have ever made or eaten! I’ve baked cookies for all 9 of us as a child ALL MY LIFE, and there is no cookie I’ve made, that ever tops this one!!! The only thing I would say is not to bake them more than 10 minutes, or they will turn out like mine, and they were a little too hard. I also agree with Tessa, and would have to say they are best eaten the day they are made. The frosting is just too die for, and tastes like a homemade Christmas caramel made on the stove. Definitely make these! Hi Tessa, can you make these into one giant cookie? And if so do you need to change the baking time? Thank you! I accidentally put one whole egg and 1 egg white in the cookie dough. I haven’t baked the cookies yet so do you think they will be fine as is or should I add the egg yoke? I made these tonight for a party. They were fantastic! I love gifting out cookies. An one thing that I have found is that soft topped cookies like this make great sandwich cookies. And then you can still add your chocolate drizzle to the outside, let set and they pack so well this way. I like red velvet cookies with cream cheese frosting but they didn’t pack well . Put another cookie on top problem solved . An little ones think that they are getting extra cookies . To start off let me tell you I am what you call a beginner baker. However, I was going to a cookie exchange and I wanted to find a cookie recipe that would rock the socks off people and this recipe did. Thank you so much for sharing! What an amazing cookie! These were very easy to make.. Simple ingredients.. Easy to prepare… The taste was oh so rich… wow… The topping I wanted to eat by itself.. Delicious.. I’m not much of a baker so these came out wonderful from a so so baker..
this Cookie Recipe sounds great but this is not a German Cookie.Pecan nuts are hard to find and very expensive and not typical German.What was the Name from the Chocolate Cake from Germany do you make these Cookies? Typical Cookies are vanilla Kipferl(vanilla crescents) or with Jam filled Butter Cookies. It is not usual to find German cookies recipies, and even that I am not going to make them by the moment, I am compiling a series of recipes that I’ve downloaded from the internet, of those that I consider that will be a good selection for a small cookie business that I am about to start. I’ve worked in the pasta and icecram industry in my country Ecuador, and I am extremely demanding with the quality and the production processes, I am sure that your recipe will definitely be an excellent addition to my cookies list. I’ll let you now how this cookies came out of my oven.